An Arkansas girl is dead after the father of a boy she and her friends were trying to prank unloaded his gun into a car full of teenagers. Probably not, I'd imagine, as the Founding Fathers intended. Fifteen-year-old Adrian Broadway and her friends were engaging in sometypical teenage hijinks early Saturday morning before the girl was killed by a gunshot wound to the head, according to local news. [Adrian Broadway and her] friends met on Friday for Taco Bell and a movie, but then they went to the home of Willie Noble on Skylark Road to pull a prank on a friend. "It was a joke. We was friends, we was gonna come over there and clean it up," Williams said. Last Halloween, [Willie] Noble's 17-year-old son had pulled his own prank. In retaliation, the group decided to cover their friend's car in eggs and leaves. 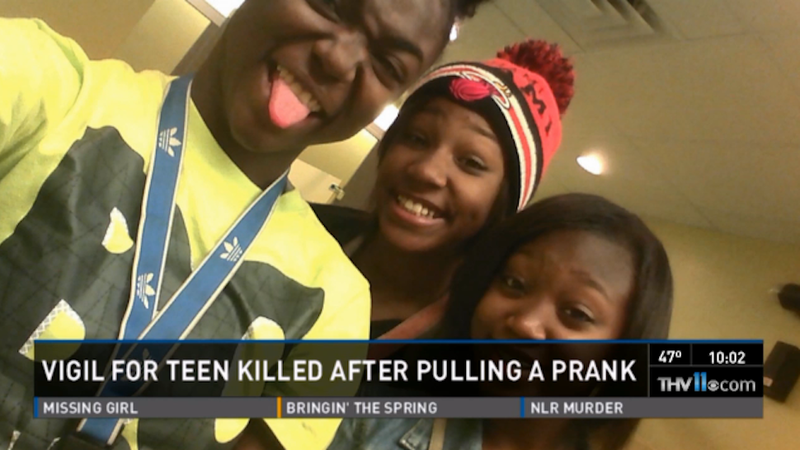 "It was supposed to be a prank; we were supposed to get up right now, and we were supposed to laugh," Williams said. Willy Noble wasn't amused by the prank and responded to the girls' prank by firing several shots into a car filled with seven teenagers. Broadway was struck in the head and died. The sane response to this is to lament the fact that someone as trigger-happy as Willie Noble was able to access a gun and lacked the sort of training that would have taught him to not shoot into a car full of teens. But, according to WTHV11, the community response was "divided." Some interviewed by local media remarked that if the girls didn't want to get shot then maybe they shouldn't be out so late at night. Because guns only go off between the hours of midnight and 4 am.